Aerial photograph of Coquitlam with Burrard Inlet on the western edge of the image. 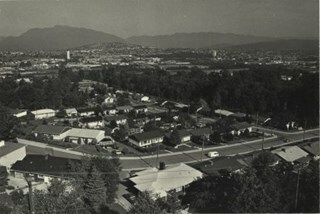 Aerial photograph of Burnaby north of Lougheed Highway and west of Sperling Avenue. 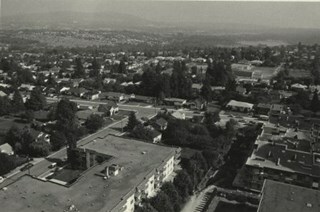 Aerial photograph of Burnaby north of Broadway and west of Sperling Avenue. Aerial photograph of Burnaby with Lougheed Highway running west to east through the middle of the photograph and the Trans Canada Highway in the lower left segment. 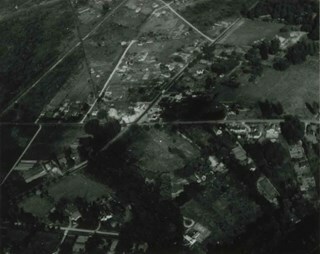 Aerial photograph of Coquitlam east of North Road and north of Brunette Avenue. Como Lake can be seen to the north. Aerial photograph of Coquitlam. Como Lake can be seen in the north west corner of the photograph. Aerial photograph of Coquitlam with Mundy Park and Lougheed Highway to the north east. 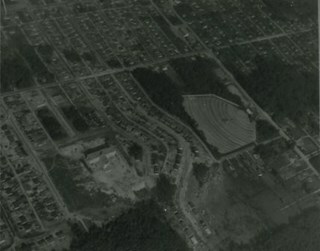 Aerial photograph of Coquitlam with Mundy Park to the north west and Lougheed Highway to the east. 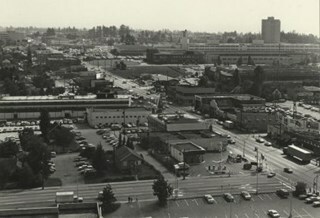 Aerial photograph of Burnaby in the area of Edmonds Street and Kingsway. Aerial photograph of Burnaby in the area north east of Kingsway. File consists of one laser copy of an aerial photograph of Vancouver including Stanely Park, Downtown Vancouver and the North Shore and one B.C. Hydro Aerial Thermography Survey pamphlet. Both of these resources were used as teaching aids for a Geography 12 class at Burnaby North Secondary School. Aerial photograph of North Burnaby with Burrard Inlet to the north and Hastings Street, Inlet Drive, Barnet Road. Aerial photograph of Burnaby Mountain and surrounding area with Burrard Inlet to the north. This photo is indentified as BC5061:82 and connects with B.C. air photograph BC5061:83 to the west and BC5061:81 to the east. This photo is indentified as BC5061:81 and connects with B.C. air photograph BC5061:82 to the west and BC5061:80 to the east. Aerial photograph of Port Moody with Burrard Inlet and Barnet Highway to the north and Burnaby Mountain to the east. Aerial photograph of Port Moody with Burrard Inlet and Barnet Highway to the north. Aerial photograph of Burrard Inlet and Port Moody. Aerial photograph of Port Moody north of Como Lake Avenue. Aerial photograph of Port Moody north of Como Lake Avenue. Burrard Inlet is visible in the top left corner. Aerial photograph of Port Moody with Barnett Highway in the north half of the image. 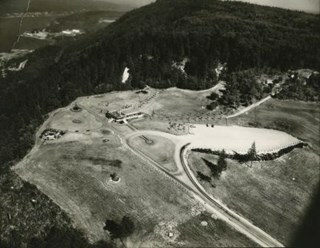 Aerial photograph of Burnaby Mountain and the Centennial Pavilion, built to mark the 1958 centennial. Aerial photograph of the Burnaby Mountain park and Centennial Pavilion, under construction. Aerial photograph of Burnaby Mountain, north of Broadway . 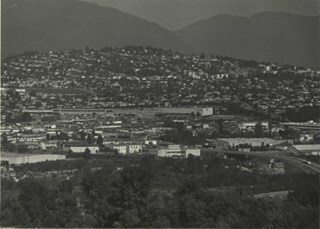 Aerial photograph of North Road and Burnaby Mountain to the west and Port Moody to the east, north of Broadway (Como Lake Avenue). Aerial photograph of Burnaby with Lougheed Highway in the north west corner, the Trans Canada Highway in the south east corner and Burnaby Lake appearing from the west. Aerial photograph of Burnaby with Lougheed Highway to the north and Burnaby Lake to the south. Aerial photograph of Burnaby with Burnaby Lake to the south and Broadway to the north. Aerial photograph of the Sperling Avenue/Douglas Road Burnaby Village area. 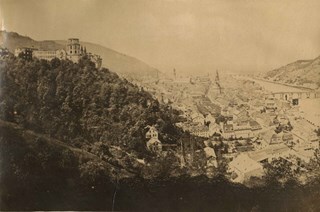 Photograph of Heidelberg, Germany. This item was in a scrapbook kept by Claude Hill who was originally from England but ultimately settled in the Burnaby Lake area. 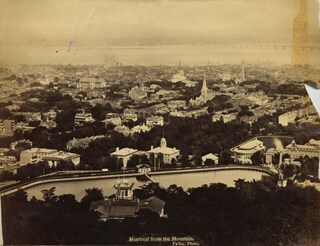 Photograph of Montreal. This photograph was in a scrapbook kept by Claude Hill who was originally from England but ultimately settled in the Burnaby Lake area. 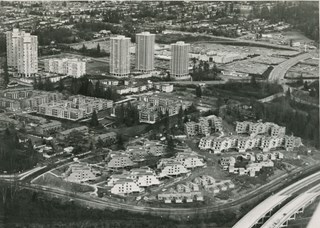 Aerial photograph of MacInnis Place with Lougheed Village in behind. MacInnis Place housing development was constructed with the intent of having 25% of its suites rented at a reduced cost to low income earners. Photograph is an aerial view looking northeast from Central Park with Forest Lawn Memorial Park and Deer Lake in the background. 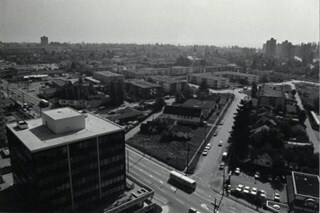 Photograph is an aerial view looking east on Kingsway, taken from the twenty-first floor of the Panorama Towers on Grange Street, with Sears and Kelly Douglas in the background. 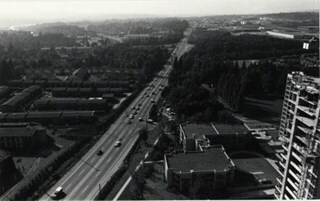 Photograph is an aerial view of Lougheed Highway, looking northwest from 9304 Salish Court - Tower West.